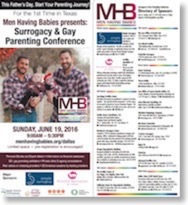 Men Having Babies (MHB) is an international non-profit organization that has helped thousands of gay men worldwide become biological parents, and its conferences are the only ones that provide unbiased information and resources focused on biological parenting options for gay men. 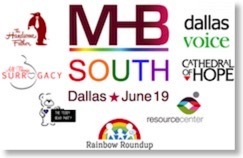 The Dallas conference received wide support from leading LGBT establishments and groups in Texas including the Dallas Voice, the Resource Center (the primary LGBT organization in North Texas), Rainbow Roundup, The Handsome Father, and the Teddy Bear Party. Professor Heather Jacobson, of the University of Texas in Arlington, presented insights from the first extensive ethnographic examination of contemporary gestational surrogacy in the United States. Jacobson wrote about this research in the recently published book – “Labor of Love: Gestational Surrogacy and the Work of Making Babies." The Dallas Voice is one of the country’s leading LGBT media companies, with over 78,000 weekly print and online readers across the DFW Metroplex. The partnership with the Dallas Voice also allowed for the extension of the Gay Parenting Resource Fair beyond the conference’s venue. The publication included a special MHB Directory Edition at its printed and online issues on June 17th, and will repeat it again at its Family LIFE directory on July 29. Among the major supporters of the assistance program are some of the sponsors of the Dallas conference, including Simple Surrogacy, Fertility Specialists of Texas, San Diego Fertility Center, Family Source Consultants, Oregon Reproductive Medicine, and Northwest Surrogacy. In addition to the local supporting organizations, additional community organizations from the region and beyond have joined to help promote the event and provide information about the resources they have for gay parents and parents-to-be. Among them are the national organization Family Equality Council, All Things Surrogacy, Gays With Kids, and Proud Parenting.